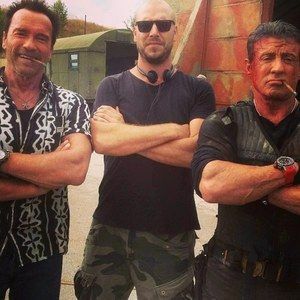 After the long holiday weekend, production continues on The Expendables 3 in Bulgaria, with star Arnold Schwarzenegger posting yet another photo from the set. Last week's photo gave us our first look at Harrison Ford, with today's shot featuring Arnold and franchise star Sylvester Stallone enjoying some cigars between takes, along with director Patrick Hughes. Hopefully Arnold will continue to post photos from the set as shooting continues in Eastern Europe. "Another shot from set. @TheSlyStallone, our director Patrick and I having a great time in Bulgaria. http://instagram.com/p/dzh2qwDcUU/"